I am so excited for the changes that have been happening in our lives, in all areas. A big one for me recently was that I took a risk to make some big changes to my health. It's funny, because two years ago, a friend from summer camp (many moons ago) introduced me to a great nutritional program. Anyone who knows me, will know that I have tried different things to gain my health back, so I was skeptical. I had grown into a confident woman, who felt comfortable in her own body... And I think that is where the problem lies. Being comfortable when overweight, with no energy, and no desire to change is not necessarily the best place to be in. One night, just out of the blue, I contacted him and said that I wanted to give it a month to see if it was something I could do... And follow through on. I also joined a 16 week challenge to help keep me motivated. Once I started using the nutritional products, I questioned why I didn't try it earlier!! My energy levels went way up, my weight was going way down and I was feeling like this may actually be something that I could accomplish! 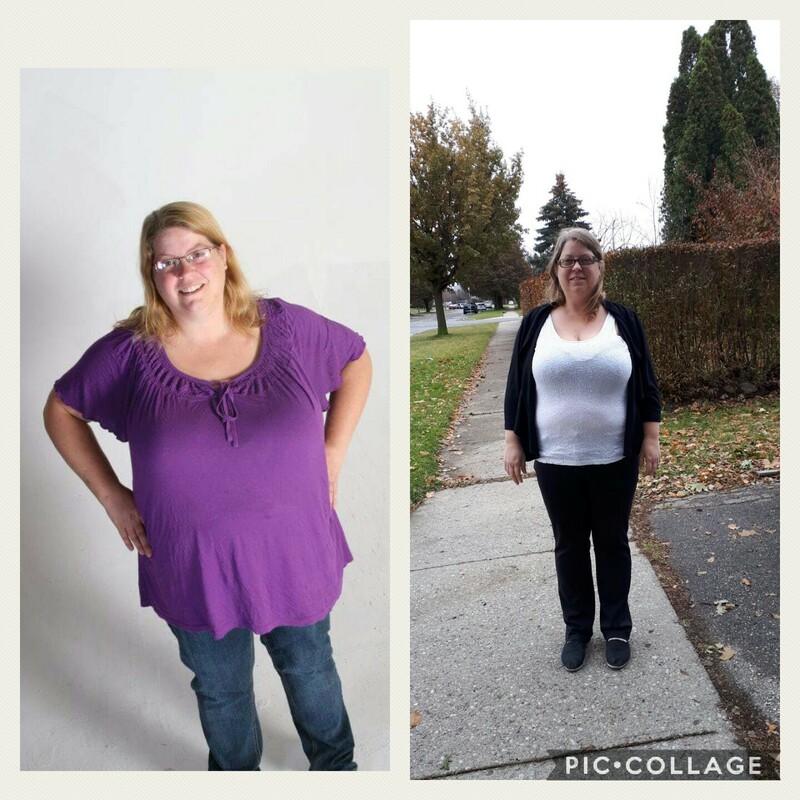 I am now 2 months in, halfway through my challenge, and I'm down 24lbs, I have gone from a 3X shirt to an XL, and a size 22 pants to a 16!! I feel great, I'm don't feel like I'm missing out on anything. I'm not having cravings (is amazing when you put exactly what your body needs inside you - no cravings!!). I have stopped pop and Iced Capps, no more daily fast food stops, no more late night trips, just to fill the void that I was filling. I honestly haven't been perfect through the past 2 months, I have eaten out with my kids, but it is a special day out (and my choices are different). I'm noticing what I actually consume and I have been enjoying coming up with meals that I look forward to. I still eat everything... Just all in moderation! We have been walking 5km a day, only one day off in the last month! We challenge each other, push each other and have fun doing this!! I'm glad that I took the plunge... I'm glad that I have started this journey, I'm maybe going to be able to win a prize!! I'm also able to have some of my products paid for, just by having others join me in this journey! 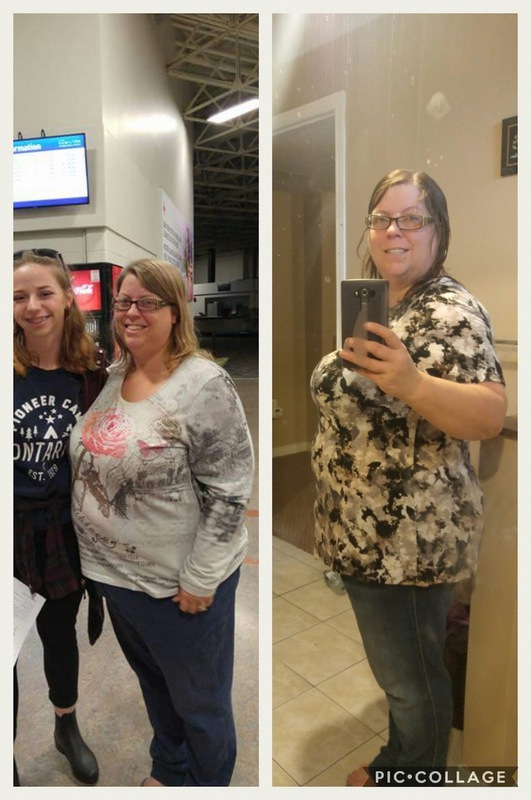 These are some before and after pictures, that I'm so excited about and help keep me motivated! My first goal was to get to "one"derland before December and I am only 5-7lbs away!! 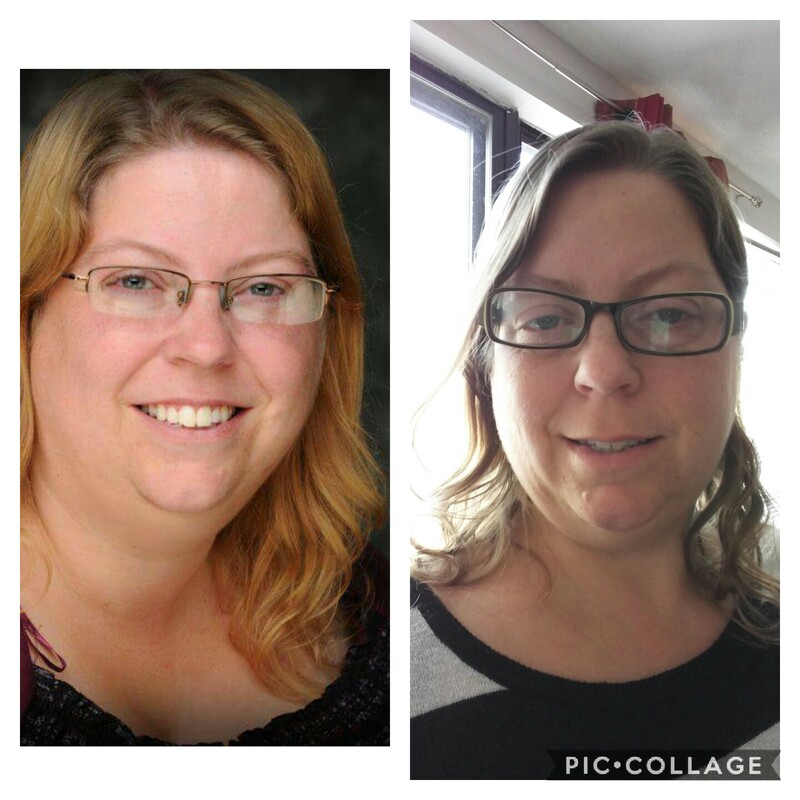 The first picture is August 2017, second is November 2017! Looking forward to sharing more progress as I go along!! My family and I are entering a new stage of life. We have struggled through a separation, leading to a divorce, kids leaving home, custody and access battles, the court system, the emotional turmoil. It has been a long few years, which, in the process has given us all a new view on life. A new perspective. We have grown into this place where we can feel confident that our love will actually stand strong and see us through. In myself, I have seen tremendous growth and I have seen myself become the strong woman that I knew was there before, but didn't know how to let out...I have confidence, I have dreams, I have my self worth back. I'm not afraid to speak up, I'm not afraid to question. I'm not afraid to stand up to those who judge, speak out of turn or even just behave out of ignorance. I've also learned that my life is just that, mine. It does not need to be displayed for all to see. Snippets fine, but some things are better kept for ourselves. I've learned that I no longer need to justify every action I take, every move I make, I am the only one who answers for those choices and I am the one who will deal with the consequences. Through my separation and time spent alone, I have questioned my faith, my stand, where my strength comes from. I have left the church, come back to the church, walked away from people who were toxic in mine and my kids lives. I have learned a lot about myself, my dreams, my ambitions and how to take the steps to reach them. I am nowhere near this point, but I am constantly growing. It is interesting to me now, to see where I'm at. To know what I've come through and know that I am at peace with my choices… No matter what anyone else thinks. I stand behind what I do 100% and am thankful for the small group of people who really know me and support me… But who are also there to pick me up if my choice fails. 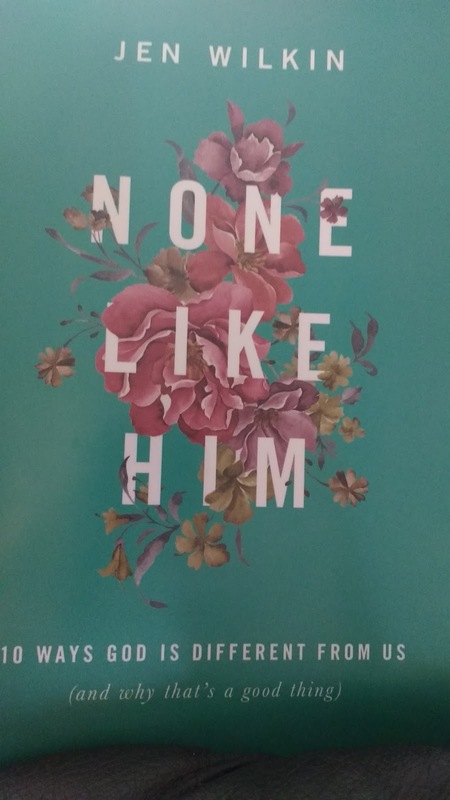 With my wedding date approaching, there is a whole new set of issues… Not only am I making a change to our family structure, which comes with a whole new set of fears and growing pains, but realizing that everyone else, who are not necessarily part of our family, has an opinion to share. So, while I am approaching conversations with my kids, who will be greatly impacted by this change, and making sure they are in a position where they still feel safe and that I'm not “giving them up”, I'm also dealing with comments about whether others think this is the right thing for me/us. I find it frustrating to an extent, that people who may have been a part of my life for a period of time, whether long or short, can voice, very loudly, what they think. Can make assumptions about myself and my partner's choice. People who think they know what is best for us, yet haven't taken the time to understand what we have already been through. I understand the extreme change that is coming. I am preparing for the “not so perfect” issues that will arise and am praying about how we are going to work through them. Just because it has been an unconventional relationship, doesn't mean that someone else knows better than those who are on the frontlines with us. I know that our “normally crazy life” is going to become even more wild, and that we are again going to go through growing pains of sorts. When is anything worthwhile in life easy? As we have always done. We take risks in life. Getting married is a risk, having a baby is a risk, moving, changing jobs, all risks. This part of my life is no more a risk then anyone elses choices. The people we will surround ourselves with are those who are going to help encourage us, not try to destroy us. They are the ones who will cry with us, and wipe our tears, not create new ones…and I am truly thankful for the people who have been genuinely happy for me. For those who have jumped in to help plan and add excited to be a part of our future. So, if you are one of those people, you are more then welcome to join us in this part of our journey. If you are not, and I have become pretty good at recognizing who those people are, then feel free to watch from the sidelines. It doesn't matter how big your team is, it only matters how strong the members are!! Stay tuned as we grow into our new normal! I have only made it through a few of the chapters in this book, because my life is so crazy busy, but I really wanted to share with you all. 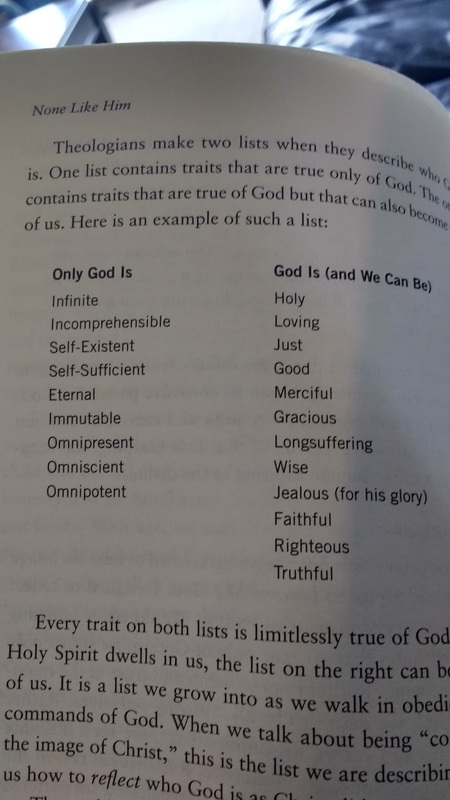 I know that God is different from me. 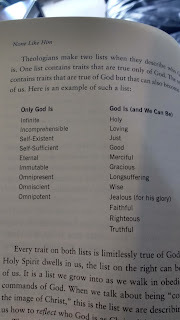 I always have, but I was intrigued by this book and to dig a little deeper into some of the characteristics of God. There are some really great stories that being this home to me. I like how the writer was able to capture everyday moments and turn them in a way to show the stark differences. It is amazing how when we think that our lives are just about us, we can turn what we are going through, what we are doing, what we see, into an avenue to learn more about the difference between God and man. 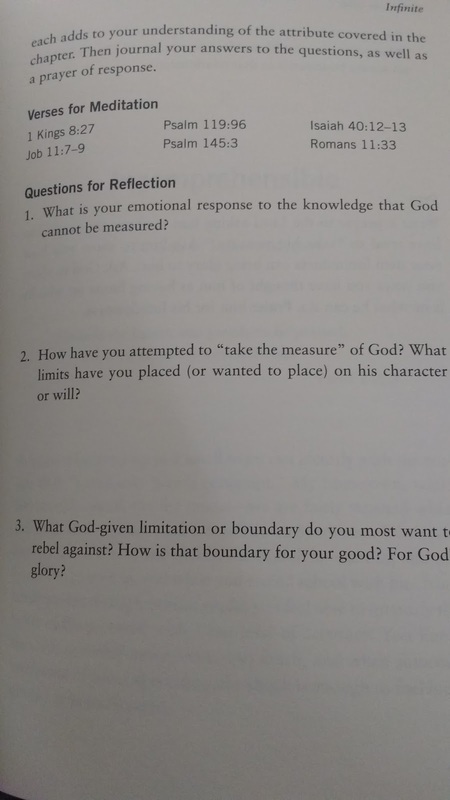 At the end of each characteristic chapter are questions that will make you think harder, and dig deeper into the realm of differences between us and to bring us to a better understanding of why these are so very important for us to know. 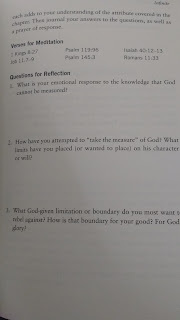 I am excited to continue reading through this and spending time on the questions. To dig deeper and to open my heart to learn and grow more, and to build my relationship even stronger then ever. 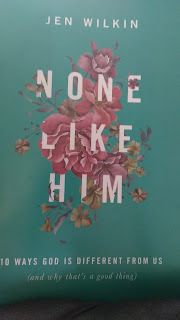 This would make a great book for a ladies group Bible Study as well, and it would be interesting to hear others points of view!! Disclaimer: I received a copy of this book to review. All opinions and comments in this post are my own. The smell of their heads, the wiggly little toes, the milestones that they each would reach at different moments. I love this video that Pampers has released, showing the little moments in our children's lives and how much they impact even us, as parents. The video reminds me of the nights that I gave up to feed, to rock, to cuddle. It also reminds me of how fast time is flying...My oldest is almost 20! What do you do to make life #BetterForBaby? Tweet it out and share with everyone! What a great way to celebrate those moments that we may take for granted - CELEBRATE THE MOMENTS!! Do You Know a Cold Weather Hero? How has this winter been for you? I can honestly say that I haven't enjoyed the cold. Most days it was just too cold to enjoy the snow and ice. It has also made me appreciate my "indoor" job a little more. But there are some amazing people out there, who know how important it is for us to have our garbage picked up, our kids helped on the way to school, our streets plowed or our city kept safe, no matter what the weather. As part of the P&G Mom program, I was given the opportunity to gift a Tide set (A Tide Scarf, Coffee Travel Mug, and Tide Cold Water Detergent) to a #TideColdHero, and when I saw this I knew exactly who I would gift it to! My parents have been an amazing part of my life, and not only do they impact myself and the kids, but they have taken on the role of impacting their neighbourhood families as well. 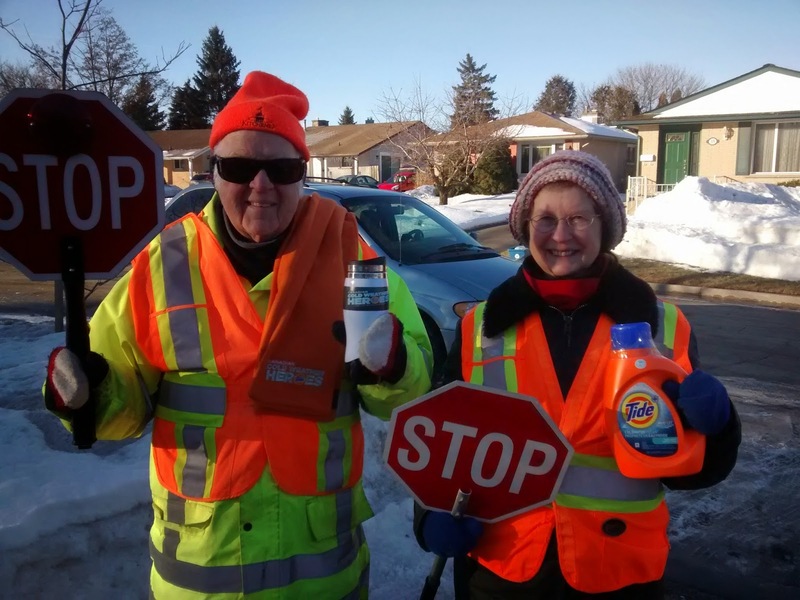 Both my parents are crossing guards in their neighbourhood, and I hear stories about how their mornings or afternoons went, how they conversed with the kids and parents, they know the different things that impact these families as well. I think that crossing guards are often overlooked and just expected, but they choose to spend their time, a few hours a day, risking their lives - drivers aren't always observant; braving the elements - whether it is frigid -35 or sweltering hot towards the end of the year; and taking responsibility for all of our kids - to help them cross the road safely AND impact their social lives, and they choose to do this job, not for the money, but because they recognize the need and strive to fulfill it. So, to my parents, to all the crossing guards, who risk their lives and brave the extreme cold/heat, THANK YOU!! Thank you for taking that role in my childs life, when I can't be there to help them get to school. Thank you for teaching my kids the social aspect of multi-generational relationships. Thank you for doing this selfless job and seeing it as an opportunity!! You Are My Cold Weather Heroes!! Our family has been broken. For almost 3 years now. I am finally acknowledging this. We are struggling to figure out how to piece our puzzle back together now. Each of us is a piece and some days we seem to not fit together perfectly. It has been a sad, emotional, and upsetting journey for us to travel. We have fought, cried, screamed, almost given up and fought even harder. I thought that I could deal with this on my own. 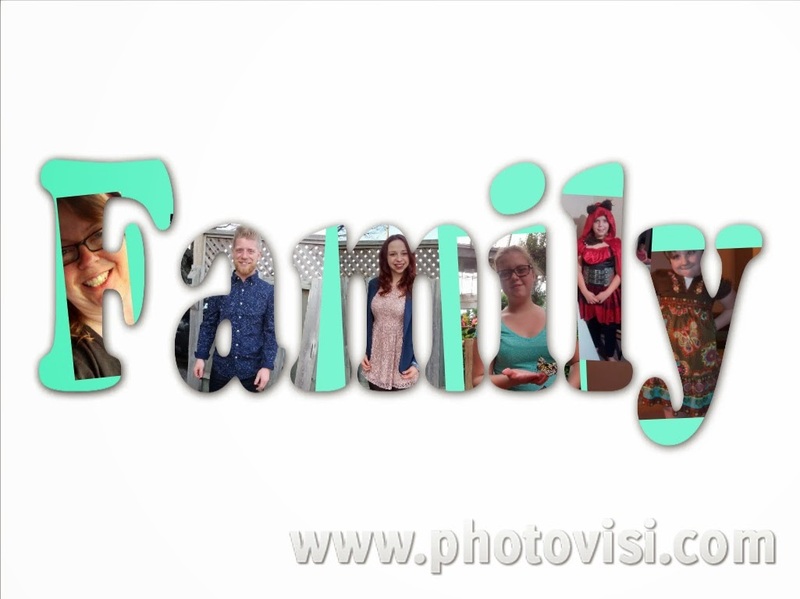 I am the mom, I should know how to put together this puzzle that is our family. I should be able to know my kids, know where and how we all fit together and everything should just be bliss. I realize now, that I can't do this on my own. I heard in church, once upon a time, a sermon that talked about believing, belonging and in the end, the behaviour will line up as well. I honestly don't remember exactly what it was referring to or what the actual context was, but I have owned this now, as it relates to my broken family. Some people know the struggles that we have been through, that we continue to go through, and I don't even want to think about what struggles will have in store for the future. These are not struggles that I share publicly, or even with all those in my circle of support, but I do share and will now share here, about how we are navigating these new waters. We have 6 people living in our house. This is us. We have all worked hard, sacrificed plenty and continue to contribute as much as possible to get to where we are. 6 people = 6 personalities. 6 personalities that don't mesh well, a lot of the time. Something that has popped back into my mind is the phrase, "BELIEVE, BELONG, BEHAVE. For me, it means that if we BELIEVE that we BELONG we are more likely to BEHAVE. This year has started very difficult. The past 2 years, I think we were all still numb and trying to figure out where we fit, this year seems to be the biggest struggle. Is it that we are all getting older? Is it that we have accepted where we are? Is it that we have lost hope? I have no answers to that. It is just where we are. Since the beginning of the year I have dealt with accepting the abuse that was in the past. I have realized the ways that I had been manipulated. I have had complete emotional breakdowns. I feel like I am still growing, still learning how to express my thoughts, still working on understanding how I arrived to this destination. But, I have also recognized that this is so much more then just me. I always knew that the kids were going to be affected, but my thinking was wrong. I have always thought that kids are resilient. They will bounce back...they do, right? Not anymore. I am wondering if this situation, which is not ideal, has finally set in and they realize that it is not going to be "FIXED". There is no more "HOPE" for our family becoming whole again. If I have struggled so much, I am now realizing how much more they are struggling. Everyone deals with sibling rivalry - and if you don't, then you absolutely need to share your magic secret, cause you could make millions! One of my children has voiced very concerning comments, we have begun counseling because of the comments as well as the acknowledgement of abuse. We are learning to navigate through those waters now too. But, my realization is that we are a puzzle, our family is a puzzle that is in a box. It only has 6 pieces, should be simple to piece them all together, right? What I am learning is that while 2 pieces may fit together and another 2 may fit together, all 6 are not connecting. It is like the little knobby piece from one has been damaged so greatly that it just will not connect. I have tried to push it in. I have tried to bend it back into shape. I have tried to gently rub the edges back into position. It's not working. The puzzle piece doesn't BELIEVE that it BELONGS. It is that realization that someone who we love, who we cherish, who is so much a part of us, doesn't believe that they belong, that has me trying to come up with new ways to mold this piece back into shape. I know this is just for a time. I know that we will get through, we always do. A diamond doesn't just become a diamond instantly, the fire and the process it was brings it to its glory. We are at a pivotal place in our story and I pray that I am making the right choices and setting the right examples. I pray that these puzzle pieces can see that they belong, no matter what. I pray that we can put our puzzle together in such a way that it never falls apart again. IN THIS FAMILY WE WILL BUILD EACH OTHER UP!! Do you have a Family Statement? This is something that I will be hanging in our house as a reminder to all of us. Do You Love To #RipYourClothesOn? I Do!! In January we received some Downy Unstopables and Ultra Downy to try out. But I really couldn't believe how great my clothes smelled. I am excited to share this giveaway with you all, and I had great plans to do up a funny video with some items I bought at Joe Fresh...but the months have zipped by. 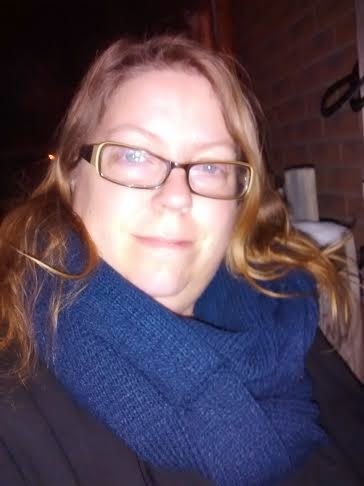 First I want to show you the great scarf that I got from Joe Fresh, I was even able to buy a shirt that fits great and is really comfy. The best part about shopping at Zehrs, where I was able to get the Joe Fresh clothing items, was that they were on the clearance rack! Their clearance had a great selection and I love that I got the scarf for the low price of 9.99! I'm all about the bargains!